We haven’t heard much on this blog about Muybridge’s tv appearances – so here’s something new. 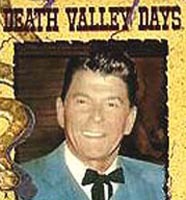 In 1964, the LA Times announced, “Reagan to Narrate ‘Death Valley Days’” – a popular tv show that had already been running for more than a decade, featuring stories from the Old West. [18 Oct 1964]. Director of the show was Reagan’s brother, Neil [South Florida Sun – Sentinel 13 Dec 1996]. 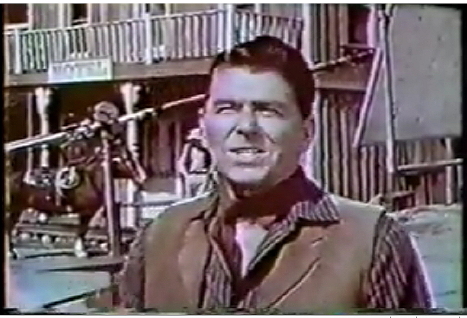 In syndication the show was variously titled: Call of the West; The Pioneers; Trails West; and Western Star Theater. “….this episode [told of an event that] settled one of the great mysteries of the animal kingdom and created the name and reputation of one of America’s best remembered photographers – and began a thread that helped lead to the development of an industry now centered in California. 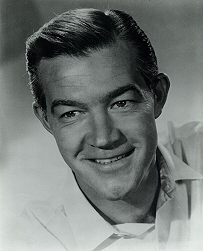 [British-born actor] Hedley Mattingly (later District Officer Hedley on Daktari) plays the photographer. He is at a local race course one day with his wife, a family acquaintance, and several important figures including California’s governor (it is 1873) Leland Stanford (Harry Holcombe). Stanford is watching his horse race a friend’s, and they start discussing the beauty of the animals, and the grace with which the horses go around the track. Stanford wondered if the horses ever had all four hoofs off the ground at the same time. His friend [Charles Cropper played “MacCrellish”] says he did not think it was possible: horses require two of their legs to be on the ground at one point of time while the others rise. It is necessary for their balance. But Stanford felt it was possible. He had run, and occasionally both of his legs were off the ground. Why not a horse. But how to find out? It was decided after the wager on this problem ($25,000.00 – a big sum of money now but more so then) to have the photographer try to photograph a horse in gallop. He was appalled at this assignment, but agreed to do it. After all, Stanford was the Governor of California. The story follows the photographer’s experiments with cameras, and the false ends many ideas lead to. But there is a second story told (though from what I recall bowdlerized). 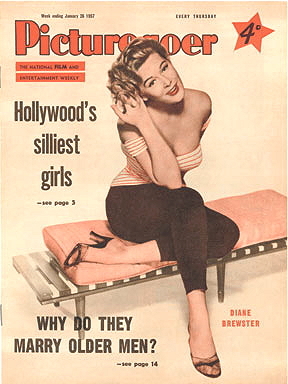 The photographer’s wife Flora (Diane Brewster), was having an affair with a family acquaintance David Neal (Lew Brown). This comes to the photographer’s attention, and complicates his search for an answer to the question. In the end the photographer set up cameras worked by trip wires all over the race course. Stanford’s horse ran down the course, and all the pictures were developed. And sure enough they showed the horse does have all four hoofs off the ground when the horse is galloping. Stanford won the bet. To prove that the pictures were not doctored, the photographer created a machine that flicked their images on a screen in order to show the horse in gallop down the track. The device, a zoopraxiscope (I believe that is how it is spelled) was the world’s first motion picture camera [projector]. Stanford congratulates the photographer, who was Eadward [sic] Muybridge, and said he showed that pictures could be made to move. The romance also was ended, but in the episode I don’t think they went into how it was ended. Muybridge is unique – he is remembered for his remarkable slow motion studies of men and animals, and he is recalled as one of the fathers of motion pictures (Edison, while working on his camera in the 1890s, met with Muybridge to check out his “rival” only to find that Muybridge had no further desire to develop motion pictures). But Muybridge is also one of the few actual killers honored by the U.S. Government by a postage stamp. You see, he killed his wife’s lover (as Congressman Daniel E. Sickels did in 1859). And like Sickels he was acquitted by the notorious “unwritten law” about killing adulterers threatening one’s marriage. That part I don’t recall was in the episode – Muybridge’s violent act occurred shortly after the bet was settled. Yeah, what did become of him? So while telling the story of one Governor of California, Reagan was about to become another. Sadly I have so far been unable to find any stills from the Muybridge-Stanford episode, but it definitely still exists – in fact, it’s available on DVD. The one tiny problem is that it’s part of a rather large DVD Box Set – all 558 episodes of the series (1952-1975). The set is sold by TV-DVD Lifestyle.com – though what kind of lifestyle would one have watching that lot (18 seasons, 46 DVDs) ? This entry was posted in biography, tv and radio and tagged Death Valley Days, Leland Stanford, Muybridge, Ronald Reagan. Now there’s a post and a half! Great to see how Muy Blog is picking up speed – positively cantering with all hooves off the ground I’d say.